Bridal showers are no longer restricted to traditional teas or sedate afternoon gatherings, and modern brides and bridesmaids can use their creativity to choose an offbeat theme. 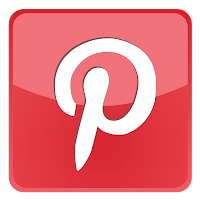 Consider today's popular bridal shower themes that will get guests in the mood to celebrate. 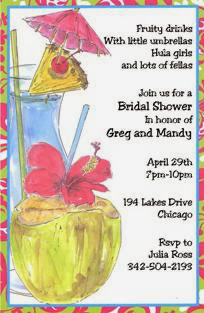 A luau theme is perfect for a summer bridal shower or for a bride whose honeymoon destination is tropical. To set the tone, select bridal shower invitations that reflect a tropical mood, such as a turquoise background with a vibrant hibiscus flower border. You can welcome guests with leis and invite them to wear tropical colors. If you have the outdoor space, consider hosting the bridal shower beneath colorful umbrellas, with the food tables covered in deep pink tablecloths and strewn with flowers. Whether the bride-to-be is from the west or just loves John Wayne movies, consider a western theme. You could send Wild West bridal shower invitations asking guests wear western attire. 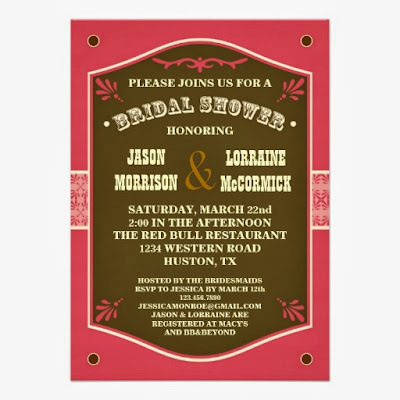 Or you might choose invitations featuring a cowgirl on a horse swinging a lasso that contains the bridal shower invitation wording. You can also consider inviting guests on a trail ride at a local farm offering horseback riding for private parties. For a more budget-friendly affair, you could invite guests to a Wild West backyard barbeque. The future bride could wear a sheriff's star and a colorful cowgirl hat to set the tone. The underlying theme of most weddings is love, which could lead to a roses are red romantic bridal shower theme. 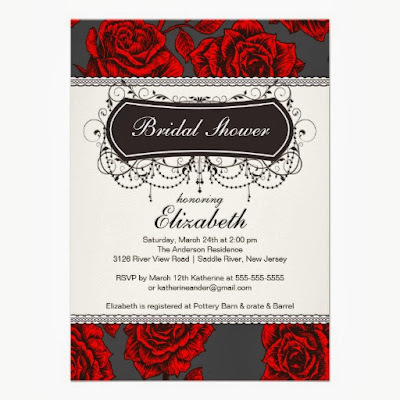 Your bridal shower invitations could be deep red and shaped like a heart, preparing guests for a sappy, romantic shower. You could watch a romantic comedy, share romantic stories about the bride and her fiancé, and gorge on dark chocolate and champagne, all the while surrounded by bouquets of red roses and carnations. What future bride couldn't use a day of relaxation and pampering to help ease the stress of planning her wedding? A spa theme is the perfect way to unwind and enjoy the company of good friends. 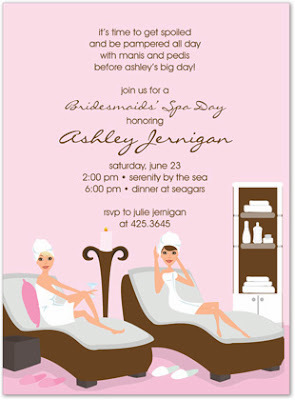 You could send ivory bridal shower invitations showing a girl in a fluffy robe, inviting guests to a spa shower. Many spas will offer package deals, giving you the freedom to choose as little or as long an event as you please. After the pampering, you might gather at a local restaurant for a post-spa meal or head to someone's home to continue the fun. There are almost limitless possibilities for choosing a bridal shower theme. 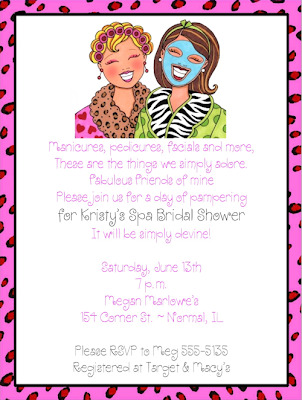 Just have fun and select a theme that matches the bride's personality for a shower no one will soon forget.